Learn how to make Pico de Gallo! 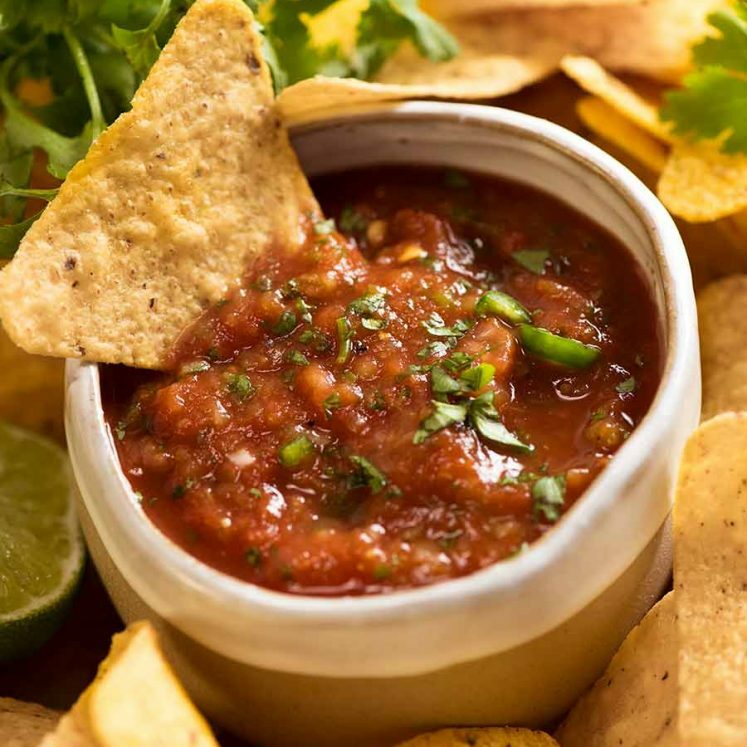 This is an authentic Mexican salsa recipe made with tomatoes is incredibly easy. 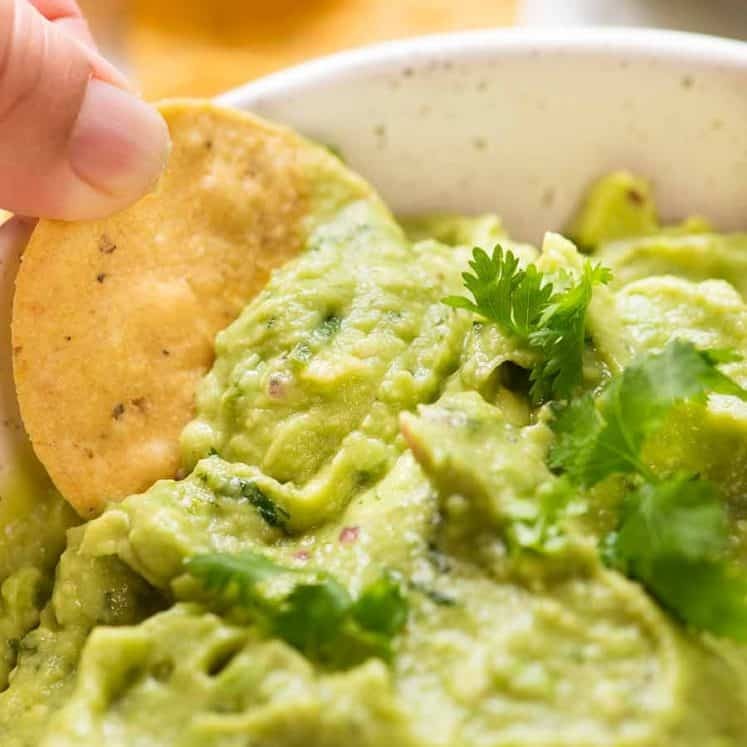 Use it for tacos, burritos, enchiladas, quesadillas, nachos, as a dip for chips or as a side for basically any Mexican dish! This can be made ahead by 1 day. 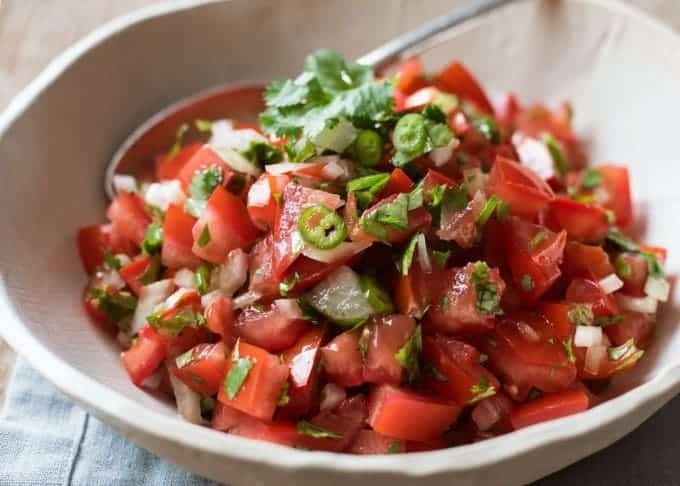 Pico de Gallo is an essential side for Mexican food. It’s stuffed in things, piled on things, served as a side. It’s by far the most well known Mexican salsa. And it’s definitely no co-incidence that the red tomato, white onion and green cilantro/coriander represent the colours of the Mexican flag! 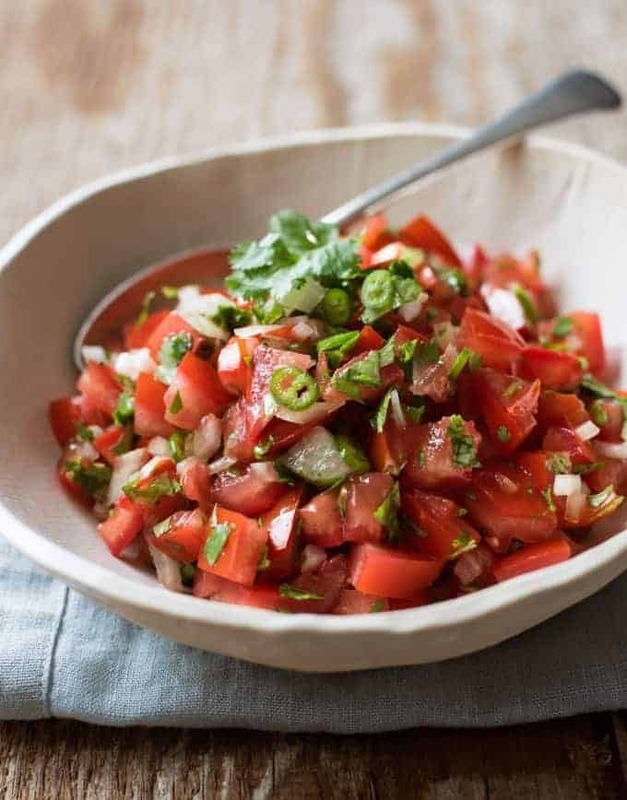 This is a classic authentic recipe for Pico de Gallo from a fabulous cookbook I got in Mexico called Truly Mexican. This cookbook, as the name suggests, is all about real Mexican food and there is an entire chapter devoted to salsas. And Pico de Gallo is the first salsa in it! You’ll find Pico de Gallo appears on the side of virtually every dish in Mexico, not just with tacos. 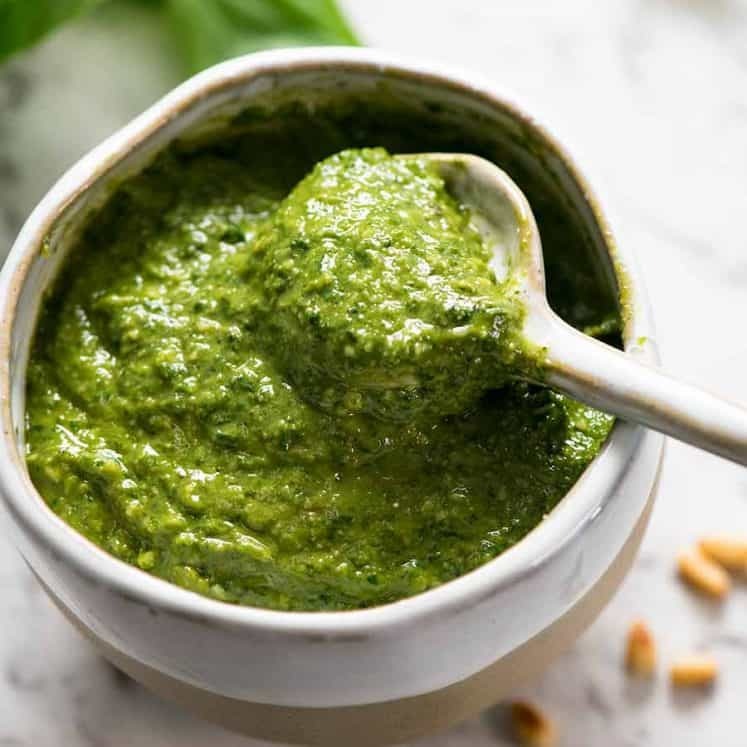 It’s served as a side dish, as a fresh side – almost like a sauce because it’s juicy – and spooned over things like Enchiladas as toppings. Nachos – or for something different, try this Nachos Pie! 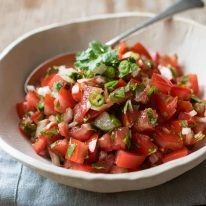 This is an authentic recipe for Pico de Gallo from "Truly Mexican", a fabulous cookbook filled with authentic Mexican recipes. Use this recipe as a base and adjust to your taste - more or less spiciness, and even add olive oil if you want! This makes enough for 8 tacos (as a topping). Cut the tomatoes in half and use a teaspoon to scoop out the seeds and watery centre. Cut into 1cm / 1/3" dice. Combine with remaining ingredients. Set aside for 5 to 20 minutes. Serve as a topping or side for things like tacos, burritos, enchiladas, quesadillas and any Mexican dish! This can be made ahead up to 1 day. Leave out the lime juice and salt (otherwise the tomato juices will leech out), cover and refrigerate. Drain excess liquid, add lime juice and salt just before serving. 1. This can be substituted with brown or red onion, eschallots/French shallots, or the white part of shallots / scallions. 2. Use this recipe as a base and adjust to your taste, especially the lime juice, chilli/jalapeno and salt. Sometimes I add pepper and olive oil, especially if I serve this as a side salad which I often do. - Top fried eggs or stuff in a folded omelette to make a Mexican breakfast! Nutrition for the whole recipe. I made this on the weekend to go with sangria and more tapas! So fresh and delicious ?